September 14 is celebrated as Hindi Diwas throughout our country as the official language of the constituent assembly in 1949. At K.R. 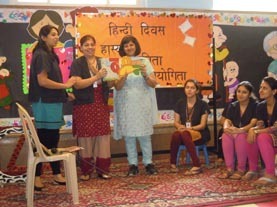 Mangalam World School, we celebrated Hindi Diwas. A special assembly was conducted to mark the day. The assembly started with a prayer in hindi, followed by a speech on significance of hindi diwas and students were told that they should not forget hindi language which had united our country during the freedom struggle spearheaded by Gandhiji. 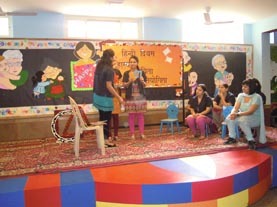 A small skit ‘Hindi ka Mahatv’ was presented by the teachers. 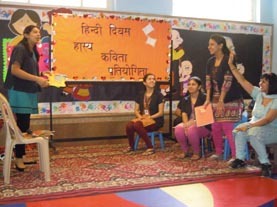 Hindi is our national language and we all should be proud of it, was the message of this humorous skit, where the teachers emphasized the importance of hindi language. However, students should be proud of their national language and should be enriched by adopting good words from the language was conveyed by the Incharge of the school. 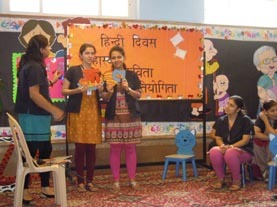 Students and teachers used hindi in their conversation through out the day. Class I students had Hasya Kavita Pratiyogita, without missing the beats and the punch lines made every one in splits of laughter. 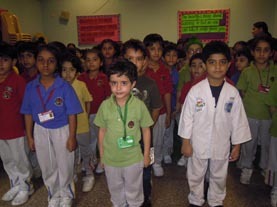 Pre-primary classes had hindi recitation competition which was most endearing. In all it was great performance put together by the students.